Staying connected while traveling is a need! Full connectivity ensures being able to communicate with loved ones, browse the internet for practical info, and share adventure in real-time. To stay connected while traveling in France there are a lot of options. In this article you’ll find out all about buying a sim card in Paris, finding free wifi in Paris, how to rent a cell phone in Paris and the best smartphone rental Paris has to offer. © SFR- republished under Creative Commons license. First of all make sure that your phone is unlocked and compatible with tri-band gsm. Once that is done, you can put any SIM card into the phone. Prepaid SIM cards are available at selected stores and some supermarkets. Look out for stores such as SFR, Bouygues Telecom, Orange, Lycamobile. Basically, you could walk into any of the mobile stores and buy a SIM card. Some newspapers stores will also have prepaid SIM cards that you can buy – checkout the newspaper stores Relay at the airport and in every big train stations. A sim card can cost as low as €13.99 to €39.99 depending on the carrier. If you’re staying more than 2 weeks in France, we recommend SFR’s sim card that you can top up every 30 days. Keep in mind that the cost of making phone calls, texts and using data in France is not cheap. You may have to top up your card a lot. To save data (and money!) we recommend to download offline apps for Paris as much as possible! You’ll not need to be connected to use them. There are a lot of free wifi zones in Paris which you’ll find in popular tourist locations like the Champs-Elysées, the area around the Notre-Dame and some of the parks in Paris. Free wifi in Paris is also available at some public libraries and museums. 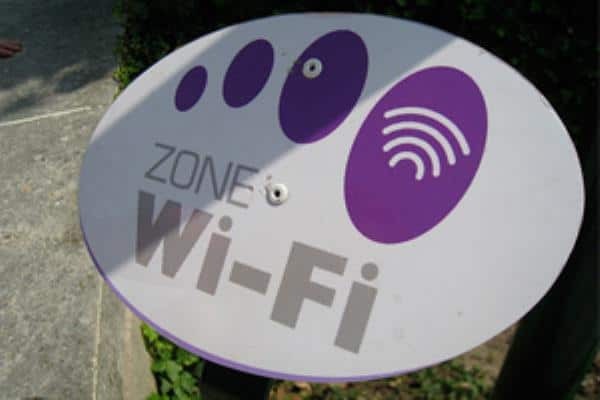 There will be signs like the photo above to indicate that you are indeed in a free WiFi zone. To connect yourself, you’ll have to create an account and open a “session”. In some areas, you may be automatically disconnected after a while and you will have to re-connect to your account and open a new session. The only downside is that the internet connection isn’t the most reliable and it doesn’t always have the best speed. The speed is usually good enough to get instant messages, but making a phone or video call and connecting on social media can be a struggle. Christmas trip to Reims - the easy alternative to Strasbourg! Ideas on special activities: what to do on your ultimate road trip in France?